The Orioles defeated the Tampa Bay Rays 11-10 in 13 innings on Tuesday night. Every Orioles win in 2010 is significant, but this one was especially so given that it was the team’s first victory on T-Shirt Tuesday. So far in 2010 the Birds are 1-3 on T-Shirt Tuesdays, 2-1 on Bobblehead Nights, and 1-1 during 2110 Eutaw Street games. With apologies to my stat-conscience baseball friends for the small sample size, the Orioles clearly need to give away more Bobbleheads at the ballpark. And as you’ll see in a moment, the Birds should feature Adam Jones in promotions more often. -On T-Shirt Tuesdays, featured batters have gone 1-8 at the plate while featured pitchers have a blown save and no wins. -On Bobblehead Nights, featured batters not named Nolan Reimold have gone 4-9 at the plate with a home run and 2 RBI. -During 2110 Eutaw Street games, Nick Markakis and Adam Jones are a combined 2-14. Adam Jones’ struggles during 2110 Eutaw Street games are inconsistent with his otherwise sterling performances on nights when he’s the featured player in a promotion. Perhaps he just hates sharing the spotlight. 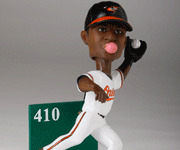 Jones went 3-5 with a home run and 2 RBI on Adam Jones Mini Bobblehead Night on June 24. Meanwhile, he went 1-2 with a home run on Adam Jones T-Shirt Tuesday on April 15, 2008.